Access your account here. You will need your library card number and PIN/password to access your account. If you do not know your PIN/password, please call the Circulation Desk at (716) 484-7135 ext. 233. You will need to bring your own laptop computer or wireless device to the library. 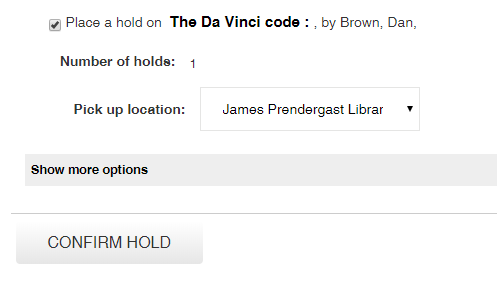 Our wireless network is called “Prendergast.” You should be able to connect anywhere in the library. When connecting to the WiFi you are agreeing to abide by Our Internet Use Policy. If you have a new card, the password is the 4 digit number the Circulation desk wrote down for you. If you don’t have a record of this, please call the Information Desk at 484-7135, ext. 225. Once you know your password, you can change it. Log in to your account HERE. Once logged in, you can change your password. To start using the library today, sign up for a 3 week temporary ID, which can be used immediately to place holds, use the library’s online databases, and download eBooks, eAudiobooks and eMagazines. To get a library card giving you full access to all materials, bring to the library at 509 Cherry Street, Jamestown, your photo ID and proof of current address. For out-of-state residents, cards cost $10 a year. Patrons must use their own cards to borrow or reserve materials. How do I make a suggestion/comment? Click on “Place Hold” under the item. If you are not already logged in when you try to place a hold, the system will prompt you to log in. Enter your Library Card number and PIN or password. If you do not know your PIN, you can call the Circulation Desk at 484-7135 ext. 233 or recover it HERE. A window will appear for you to specify where you want to pick up the item when it arrives. Click Confirm Hold. The system will tell you if the hold was successfully placed or not. Once you have placed a hold on an item, you will be able to see it under the Holds tab in your account.